The word is Revolution. Maoists give a leg up to tribal languages. It’s not just guns that keep the engine of the Maoist rebellion revving. Away from the battlefield, in the quiet of the camp schools, textbooks developed by the “people’s government” are becoming crucial tools in the next war, the one for young minds. 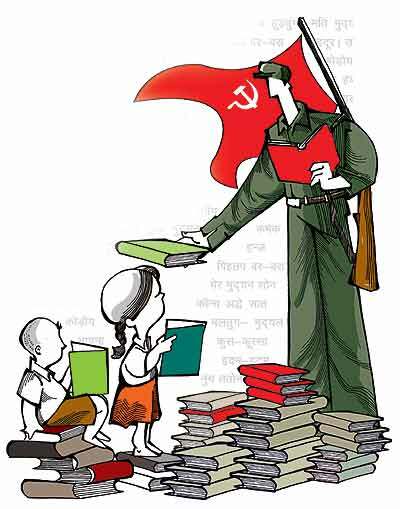 The books may be focusing more on the Maoist worldview, but to children in the tribal regions of Chhattisgarh they are often the only means of education. Outlook met with a few outsiders who had a chance to look through the texts, and asked them about the greater role it plays in the Maoist heartland. Gautam Navlakha, consultant editor of the Economic and Political Weekly, spent about a fortnight deep in the Dandakaranya jungles in January this year and got a close-up look at the way the Maoists function. He says the “people’s government” in the Dandakaranya division already uses four textbooks for mathematics, social science, politics and Hindi for classes I to V. The books are written in Gondi, which is the language of instruction (also referred to as the “lingua franca” of the Naxal movement). There are about 2.7 million speakers of Gondi, according to the 2001 census, and it is a “non-scheduled” language. Published by the Janathana Sarkar from an undisclosed location in Dandakaranya, the books are mostly in black-and-white with sparse use of colour illustrations. Besides textbooks, the Maoists also use DVDs to screen films on science and history and draw inspiration from the Hoshangabad Science Teaching Programme, a now-folded, highly popular science-teaching approach that stresses on learning by doing. Another four textbooks are in the works which will cover the history of Dandakaranya, culture, biology and general science. Of course, the Maoists are likely to tint the forthcoming history textbook with “their version” of it. “It’ll obviously comprise their understanding of who they are as a people and what they have experienced at the hands of the Indian state. I would be surprised if it’s treated any other way,” says Navlakha. The utter official neglect of tribal languages has made Maoists the sole guardians of Gondi. Next step: a new script. Shubhranshu Choudhary, a journalist who recently helped set up a news service available on cellphones in Chhattisgarh, has also seen some of the textbooks. 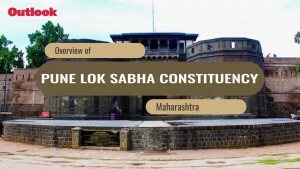 “There is obviously a lot of emphasis on the history of the tribal people with pictures of leaders like Gundadhur and Birsa Munda. There is also the predictable familiarisation with icons like Mao and Marx and Indian leaders like Charu Mazumdar and Kanai Chatterjee,” he says, talking of images from the books. But it’s not just ideology—the social science textbooks are replete with practical tips, for example, on basic hygiene. “There are pictures that ask children to wash their hands before eating, boil water before drinking it and to sleep under a mosquito net,” he adds. Details of the text are difficult to ascertain as most outsiders who have visited the areas, including Choudhary, did not read or understand Gondi. One thing they all agree on, though, is the fact that these textbooks fill a gaping linguistic and literacy gap. State-run schools are hard to come by in these regions and government teachers anyway rarely speak the tribal languages. Also, given the utter official neglect of tribal languages, the Maoists have become, some say, the guardians of Gondi. An indication of this, according to Navlakha, is how the Naxals are now veering towards creating a new script for Gondi. “But I really don’t know when they’ll have one ready,” he says. Some claim that Gondi had a script, but those claims are still unsubstantiated. The language earlier used the Telugu script and presently employs Devanagri. While there are linguistic reasons for a switch as some Gondi sounds cannot be transliterated into the Devanagri, one of the main reasons for developing a new script is to reassert an independent tribal identity. Drubbed convincingly in this game of linguistic one-upmanship, the state and the Centre have finally realised it must give up its indolent approach to tribal languages and cultures if the people have to be weaned away from the Naxals. On cue, the government of Chhattisgarh—where most Gondi speakers live and which has had no textbook either for or in Gondi—has brought out for the first time a textbook to teach Gondi, Chhattisgarhi, Korku, Halbi and Surgujia in classes III, IV and V. “This will send out a positive message to the tribals that the government wants to reach out to them. It may be late but better late than never,” says Subhash Mishra, GM at the Chhattisgarh Textbook Corporation. Meanwhile, the HRD ministry has also got into the act, with a roundtable in March this year to help preserve tribal languages and knowledge systems. “The thinking is that in the many-pronged approach to deal with Maoism, protecting the tribal languages and culture is an essential one,” says Ganesh Devy, an authority on tribal affairs and member of the roundtable. In sync, the Mysore-based Central Institute of Indian Languages (CIIL) is organising a major conference in June to kickstart training and development of manuals in various tribal languages. Census data shows that two tribals out of three do not speak their native tongue. “Language loss is not an act of volition. If we have to stop the tribals from feeling dispossessed, we have to reinvest in their culture, language,” says CIIL deputy director Rajesh Sachdeva.